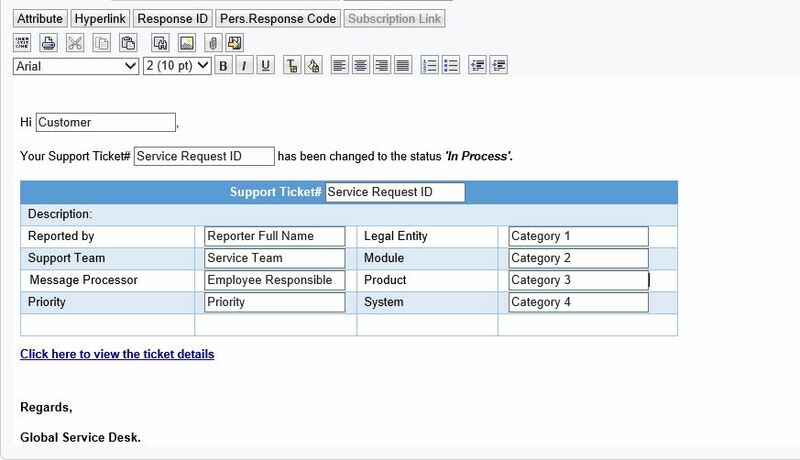 In Solution Manager, we frequently get the requirements to send the email notifications to the reporter or message processor. We create the HTML mailform and implement the BAdI: EXEC_METHODCALL_PPF to send the notifications. Although, we use HTML mailforms, most of us used the emails in plain text (agreed?! 😉 ). So, I wanted to give some rich look to the email. Here, I will show you how you can create an email with a tabular format without using Smartforms. I assume, you all know how to implement the BAdI: EXEC_METHODCALL_PPF and pass the data to attributes we define in the mailform. When I was creating the mailforms in WebUI, I did not see any option to create a table in mailform editor. But, we can still achieve the tabular format. Open your Outlook mail and open a new mail. Create a tabular format with the required columns and rows. I created a table with 7 x 4 format. And, then I used the design “GridTable 4 – Accent 1” to apply. Then, go to Mailform editor in WebUI and paste the table. The mailform editor will automatically create some HTML code behind it. If you know CSS and HTML coding, you can add more options to the table. But, there will be some restrictions for CSS in Outlook. You should consider those restrictions before using any CSS in your mailform. Then, add the required labels and attributes to your table. I have taken some of the attributes from Service Request context. Your mailform is ready now. 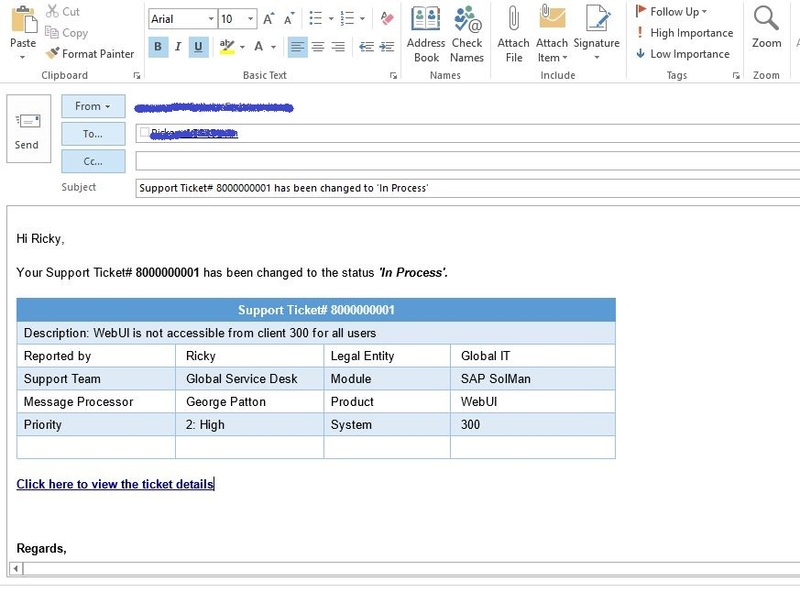 Implement the BAdI: EXEC_METHODCALL_PPF to pass the values to the attributes and send the email. You may get some problems with the row height after pasting the table in mailform editor. Don’t worry. Just go to HTML coding section, and find “height: ” and change the value there. Caution: If you are not sure about HTML coding, please do NOT change it directly. You may use other editors like NOTEPAD++ or Chrome editors. Otherwise, you will end up with weird display of your table. I hope, this will be helpful to someone! Thanks!! How do you generate a link to a certain incident? What is the result of pressing the link “Click here to view the ticket details”? If you click the link, it will open the corresponding ticket details in WebUI. You can check the below WiKi for creating the links to open the tickets directly from Outlook email. And,to create that link, either you can add HTML tag <a href=”..(put the URL link here)..”> just before that text (and ends with </a> ) or you can use one attribute from Service Request context and then pass the complete link to that attribute as a value. Hello, can you help me with this?